July 12, 2011: Silky Serenade at Stonestreet Farms. In 2011, I drove to Kentucky to spend a few days touring farms in the Lexington area. It’s one of my absolute favorite things to do. I went specifically because I made it onto the list to visit Rachel Alexandra at Stonestreet Farms. While I was there, I got to meet some of the broodmare band that calls Stonestreet home. What an amazing group of mares! One of the more curious girls was Silky Serenade. She’s by Unbridled’s Song out of the mare Smooth As Silk, which makes her a half-sister to Grade 2 winner Private Vow. Barbara Banke’s Grace Stables bought Smooth As Silk for $1.35 million at Keeneland in 2006 while she was pregnant with Silky Serenade, so Stonestreet has been Silky’s home her entire life. And she’s just as sweet as she looks in these pictures! 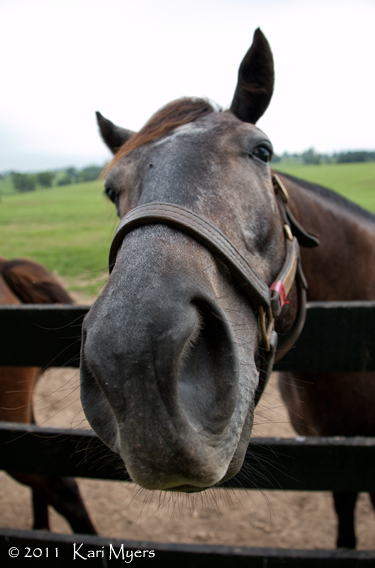 July 12, 2011: Silky Serenade was awfully curious about my camera. 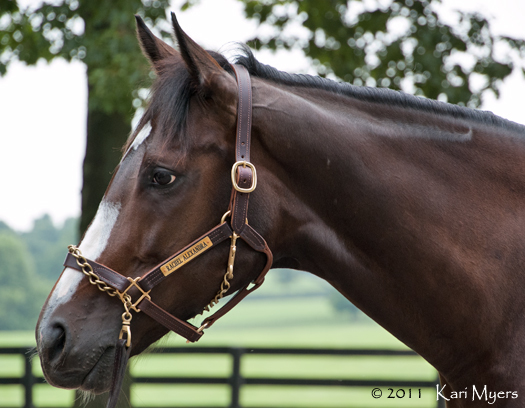 July 12, 2011: Rachel Alexandra at Stonestreet Farm. Rachel Alexandra became a fan favorite in 2009 during a record-setting campaign that saw her beat the boys three times, become the first female in 85 years to win the Preakness, and become the first female ever to win the Woodward. She capped 2009 by winning Horse of the Year and 3-Year-Old Filly Eclipse awards. Rachel gave birth to her second foal, a filly by Bernardini, last week on February 12, 2013. All was not right the next day, so she was sent to Rood & Riddle for exploratory surgery and had repair done to a bruised small colon. Her foal has since been transferred to a nurse mare and Rachel appears to be improving, but I wanted to add my well wishes to her speedy recovery. Get well soon, Rachel! Stonestreet has been incredibly good to the fans who fell in love with Rachel on the track, and they’ve been very open about both of her foals and her recovery at Rood & Riddle. 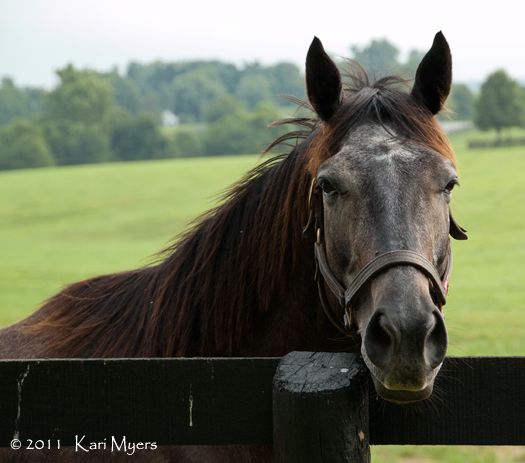 In 2011, I was lucky enough to be chosen to visit Stonestreet during the early stages of Rachel’s first pregnancy. (She is pregnant with her Curlin colt, Jess’s Dream, in the photos included here.) She was amazingly calm and sweet, letting us all go up and have photos taken with her without batting an eye. She took the petting, hugs, and adoration in stride and seemed to enjoy it all quite a bit. Stonestreet is such a class act, and Rachel is a true jewel. Here’s hoping she’s feeling better as soon as possible! 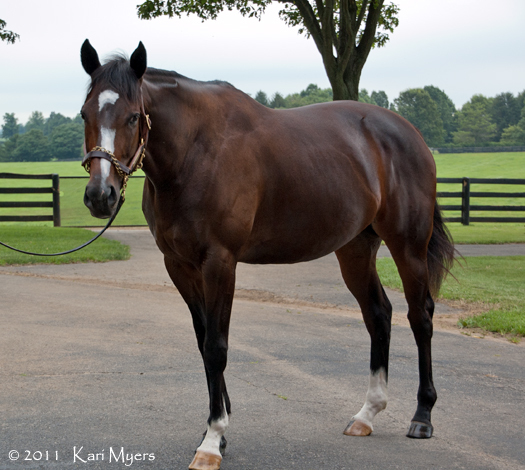 July 12, 2011: Rachel Alexandra at Stonestreet Farm, in the early stages of her first pregnancy. 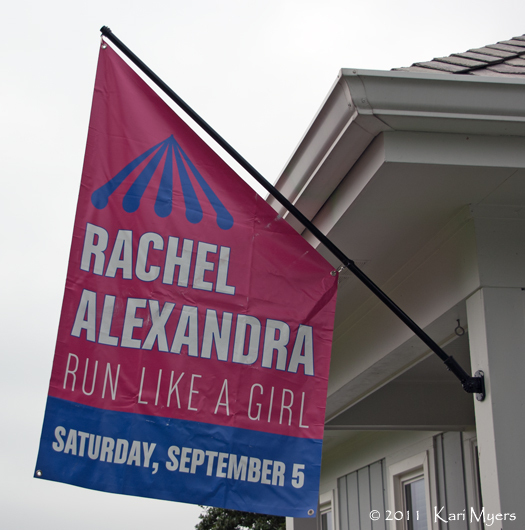 July 12, 2011: The ‘Run Like a Girl’ banner from Rachel Alexandra’s start in the 2009 Woodward, flying at the office of Stonestreet Farm.